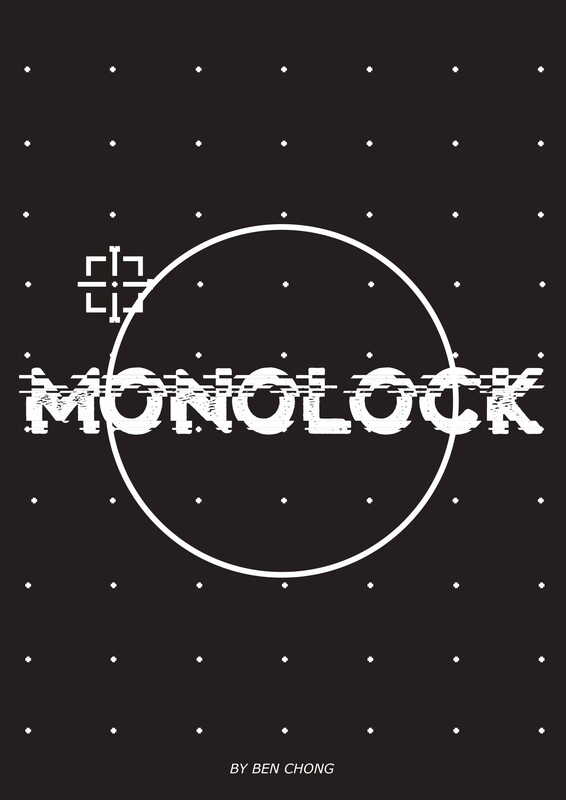 MONOLOCK is a game of horror, survival and sacrifice. MONOLOCK is played with 3-5 players, all part of a mecha squadron attempting to survive and flee the Predator - an unrelenting foe who they can't see nor fight. 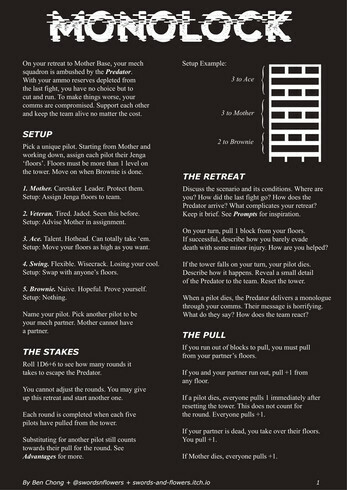 To play, players will pull from a central Jenga tower to determine their fates. Choose from 5 unique pilots. Each with their own Advantages to survive the escape. Run a GM-less, quick-prep game of survival cat-and-mouse horror. Create atmospheric, tight escapes and confrontations against the Predator as it hunts you down. Generate tension and horror in your environment with a whole list of tables for location, complications and details for the Predator. Narrate dramatic deaths and monologues as the Predator compromises your comms channels. Print out in either sleek, gritty BLACK or an easier, less demanding INVERTED/WHITE colour document. MONOLOCK is free to use & remix, and licensed under Creative Commons Attribution 4.0 International License. Made for the Emotional Mecha Jam. When you are enclosed in a high-tech suit of metal armor and wield the most advanced weaponry your society has to offer, it can be easy to feel comfortable. MONOLOCK is an incredibly atmospheric jenga-based RPG that does away with this feeling of safety. You are vulnerable, you are prey, and you can’t even see the thing stalking you through the skies. The rules are a bit cryptic, but they do a good job of evoking a hotshot mech team fleeing from something far too powerful to face. MONOLOCK is reminiscent of another well known jenga-based RPG, Dread, with some additional powers and limitations to give it a more tactical feel. This comment feels too real.